Well hunting season is upon us for some of the lucky ones while other parts of the country are still counting down the days/hours until opening day comes when they can finally be themselves again. With hunting season, a lot of us either go through our old gear and make sure it is working well while others get their new gear out and make sure it works as good as it's supposed to. For me I have been lucky enough to score a few new items this year that I feel pretty fortunate about and want to let you know what I think about them. The gear I will tell you about today is the Minox MD 50 spotting scope. If some of you haven't heard of Minox Optics yet I encourage you to check them out. Minox is a Premier German Optics company who has been producing quality products for over 75 years. Minox is working their way into America building a very reputable name for their products by providing not only a quality products but also a reliable one with a Total Coverage Warranty. I doubt you would ever have to use the warranty but it is comforting that it is there... Now to the MD 50! When looking at a picture of the MD 50 you can tell that it is a smaller spotting scope than what most of us may be used to. What impressed me the most besides the size was how light it was! This spotter is just over 8 inches long and weighs less than a pound and a half! This is perfect for throwing in my hunting pack and not having to sacrifice half my pack as well as 6 pounds just for a spotting scope! This is true especially if you are a hunter who does a lot of backpacking or if you do a lot of spot and stalk type of hunts. In those certain situations, this spotter is ideal! I took the MD 50 out on a few different occasions to test it out and see what I thought. The first trip I took it on was out coyote hunting. On this hunt I didn't have much except my coyote calls, my rifle, and the spotting scope. I placed the spotter on a tripod and packed it around in my hand rather than taking it in a pack. On the trip I would go from spot to spot stopping at high points and glassing for coyotes coming into my calls. What I liked about the MD 50 on this trip was the fact that it was simple, light, and just enough power to make it worth it. I could have had my binoculars or used my rifle scope to glass for coyotes moving through the sage brush but it was a lot more comfortable sitting and looking through a spotting scope. The spotter was light enough that I never got tired of carrying it and it wasn't annoyingly big to be carrying around in the sage brush. Even though the trip was unsuccessful for coyotes I enjoyed trying the MD 50 out in a situation where I had to carry it around by hand. The second trip I took it on was out spot and stalk hunting antelope with my brother and dad. This trip was a lot more labor extensive than my simple coyote hunt. For anyone who hasn't spot and stalked antelope, it involves a lot of spotting not only for the antelope but also to find a way to make a successful stalk. With this type of hunting I was wondering how a spotting scope this small would perform when looking through it for hours and hours on a single day. Starting off in the morning my brother and I both sat up on a high spot glassing the area for antelope. Once again I sat up the scope on my tripod and glassed back and fourth for quite some time. After not seeing any antelope we went to a second location where we quickly found a herd of antelope. While sitting on top of the a shady hill I set my spotter up on my tripod and made myself comfortable. We decided that I would stay on top of the high point, watch my nephew that we brought with us and let my brother and dad put a stalk on the goats. The MD 50 comes in two styles, you can either get the straight angled or the MD 50 W which has an angled eye piece. I myself have the straight angle and like the fact that I can look straight outward instead of putting my head down to look through the eye piece. I literally spend a good 2.5-3 hours looking through this scope watching my dad and brother sneak in on a heard of 16 antelope. As the my dad and brother got closer and closer, the antelope made their way toward my dad who was presented with a shot but unfortunately missed. After belly crawling for half a mile in 95 degree weather without water I'm not sure why he wasn't able to make the shot but I won't criticize him :) I was able to watch the entire stalk nice and clear from 1500+ yards away. 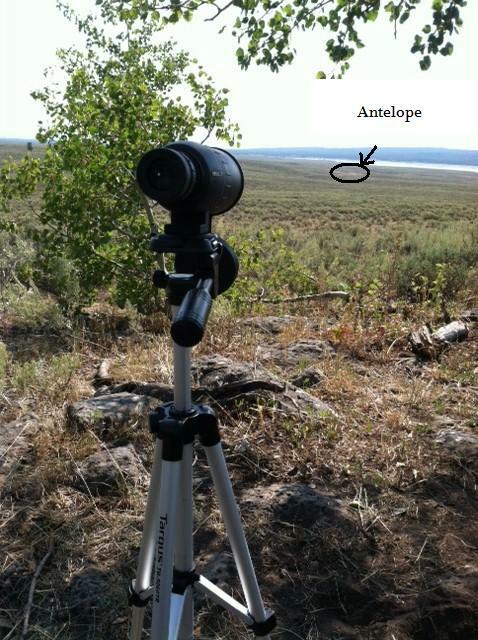 Below is a picture of how far away the antelope were from the spot I was set up. The antelope were bedded down on the back side of this grassy spot... over 1500 yards away! The spotting scope was a great tool for this hunt and I love it more and more every time I use it! The Minox MD 50 runs between $260 and $300 which is a great price considering the quality of product you get! I could try to explain how clear and simple the Minox MD 50 is to use and operate but the only words that come to my mind and clear and simple. The view on this spotter is extremely clear and provides an amazing view on whatever you are looking at. It gathers enough light in the early morning situations that you can tell what you are looking at. The clarity of all the Minox products I have placed my hands on has absolutely amazed me! This spotting scope is defiantly one that I will have in my pack all season long no matter where or what I am hunting. I was even considering packing it in place of my binoculars but couldn't figure out how to attach it to my binocular straps for easy access! The MD 50 is extremely light and compact where you don't have to sacrifice space or weight in order to pack it on your hunting or scouting trips as well as making it simple and easy to use in the field. I would highly recommend this spotting scope as well as any products that Minox makes. I love the Minox products and hope that you all check them out and let them know I sent you their way! As with all reviews on Idaho Pursuit, the following review is my honest opinion. I am not a pro-staff member of, sponsored by, or associated with Minox Optics and am not accepting any compensation, monetary or otherwise, in exchange for this review. My independent status may change in the future but, as of the date of publication, no relationship other than described above has been pursued or established. Before diving into this I want to clarify that I do not claim to be an expert on this but I do want to share what I believe to be important when looking at a gear review to help you in a purchase of new gear. I am also not attacking anyone for the way they may do gear reviews nor am I saying that I do the best gear reviews out there. I am just sharing what I think is useful in reviewing a gear review. I believe this information could be useful for both consumers as well as for companies looking for people to perform gear reviews. As an online blogger I see a lot of "gear reviews" done by other bloggers that have caught my eye. Some times the things that catch my eye make me not believe a single thing on the review and in some incidences even discredit the whole blog. Once again that is just my opinion and I have my own reasoning for such conclusions. Other times the things that catch my eye make me overly excited about the gear. Reviews that are done right sell people like me on trying out new gear! Below are some things I look for when reading a review. It is important to look at how the reviewer tested the gear. When I was talking to Ribz Front Packs about their gear and possible doing a review, the owner expressed a frustration of how some people doing a review just wore the pack around the house. Be sure the review actually FIELD tests the gear! Anyone can try something on inside a store but the purpose of a review is to tell people how the gear performs in the field. So when reading a review check for WHERE they tested the gear (if the reviewer does not specify if they used it in the field, it was probably tested in their living room). Also look for how intense the gear was tested. If you want gear that is durable and quality you need to check to see if the gear was tested for a few days or if it was a quick 5 minute "test" just so they could write a review and snap a few pictures. By checking for these things you protect yourself from buying something that isn't going to suit your needs or wasting money on something that is going to fall apart the second time you use it. Another thing to look for is how often the gear was used. If the reviewer only uses the item once for the review then the gear may not be as valuable as they are claiming it to be. Look through the reviewers other posts to see if they mention the product multiple times. With this I know that you may not use some items as often as others but if a product is worth it the reviewer will often mention it in other posts as well as on their other social network accounts (ie. Facebook, twitter, Instagram, etc...). A quick easy way to see if a review is worth while is to take a look at the pictures provided. If the pictures have houses, sidewalks, or kitchen counters in the background then that may be a sign that the review is lacking in quality field testing. Once again this isn't a guarantee but be sure to check it out. If the reviewer says they took the gear on an intense hunting trip and all you see are pictures with kitchen cupboards in the background I would question the validity of the review. Do take into consideration the time of year the review was done also. If I sent out a review of my ice fishing gear in mid July then the review would even cause myself to question how accurate it would be. This is one of the items I struggle with the most. A pro staff member is asked to promote a companies products so it is inevitable that they are going to say the product is a good one. At the same time, most pro-staff members are quality outdoors men who have worked hard to be where they are in their social networking. Be sure not to be easily convinced the product is good just because a pro-staff member says it is. Be sure that the pro-staff member can chat with you about the product, how they tested it, and what the products strengths and weaknesses are. Many of the online bloggers have a twitter or Facebook account where they would gladly chat with you about their review. 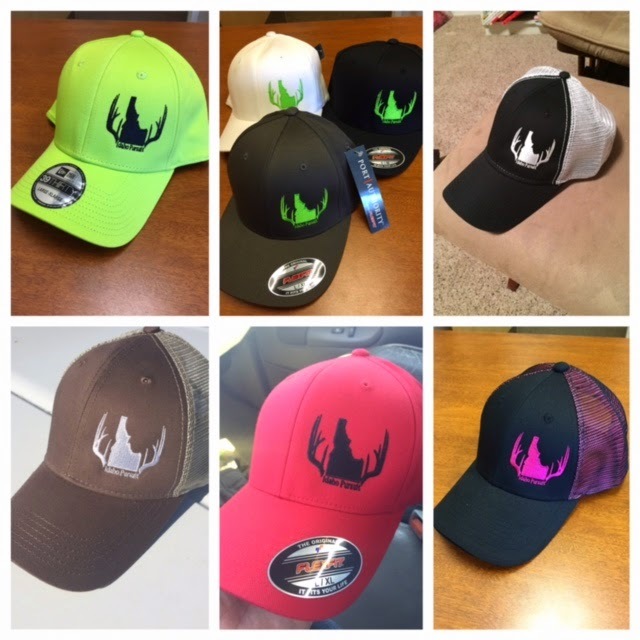 This is your way of making sure there aren't any inconsistencies between what the review says and what the pro staffer has to say about the gear. It is also important to ask the pro staffer if there are others who have done a review on the same gear this way you can base your decision off more than just one opinion. Remember, these are just some things to look for and be aware of when using a review while searching for new gear. There are a lot of good bloggers out there who share some great information. Even with the best blogs out there, it is important that you do your research and not just take someone's word on it. This keeps us bloggers honest with the companies we promised to give their product a good review. If you are aware of these things you will be able to tell the difference between those who do gear reviews because they like to test the gear and give it an honest review and those who agree to do a "gear review" just to get their hands on some gear. Like I said I don't claim to do the best gear reviews out there but I try to make sure my review gives the consumer as well as the producer the most honest opinion I can to ensure the product is accurately tested and reviewed. Some of the other bloggers I have see write and produce good reviews are: SoCal Bowhunter, Sole Adventure, High Country Bowhunter, The Will To Hunt, and a few others. Remember that This information is to protect yourself from buying a product that will not be good for you in the future. This is not information that is meant to bash or criticize anyone's blog or their efforts on gear reviews. My Top 3 Reasons I Look Forward To Hunting Season! Many of you are like me as in that we are counting down the days (maybe even the hours/minutes) until hunting season begins. Those who don't hunt they think we are just a bunch of crazy fools who have nothing better to do with our lives. There are a lot of different reasons why we each enjoy hunting season so much and look forward to it every year just like a little kid looks forward to Christmas day. While thinking about all of the different reasons why I look forward to hunting season I narrowed it down to my top three reasons and decided to share them with you. The Adventure/Challenge - I love the outdoors and absolutely love the sense of adventure that comes with hunting season. Even after hunting an area for 10 years straight I still experience different situations all season long. Each season I have to remind myself that the animals I am hunting are always adapting so I in return need to adapt and advance my hunting strategies every year to keep ensure being successful. This to me is a new adventure every time I hit my hunting area. Using trail cameras and other scouting methods to keep up on the game is always an adventure to me. I also enjoy the adventure of finding new places to hunt. Whether it is because an old area isn't producing the animals you would like, or if it is because you just want to change things up, finding a new hunting area is always an adventure and challenge. Going through the challenge of learning a new hunting area, where the animals travel, bed, feed, or flee to when they are spooked is one of my favorite yet frustrating parts of hunting to me at times. There are many times you put in a lot of work to find a new spot just to find out that the area is a dud.... but that one time you find an area that has exactly what you are looking for is worth all of those other failed scouting trips. The Outdoors - This is similar to my point above but I think of it differently. Words cannot describe how amazing it is to be sitting in a tree stand for hours until you watch a wild animal slowly make its way into the perfect spot allowing you to make the shot. Even if you never see the "shooter" or the animal you are after, spending that time in the outdoors surrounded by nature is truly indescribable. There are areas I have been that make you feel like you may be the first person to ever step foot in that area because of how majestic it is. Times like that remind me that hunting is more than just filling a tag or bagging a trophy. Simply enjoying the area you are blessed to be in is by far one of the greatest privilages we share as hunters! It doesn't matter where you hunt, every area has something unique to offer. You may not have the Grand Teton's in view or maybe not some monumental landmark of some kind but as outdoors men and women you can find the beauty each area is hiding for those who seek for it. The last reason I look forward to hunting season so much is because of who I spend it with! Family and Friends - For me my hunting season is primarily with family but occasionally I get out with a friend or two and go on a hunt. It doesn't matter if you have one hunting buddy or fifty, all of us who have someone to hunt with recognizes the joy that comes from sharing the hunting experience with someone else. There have been times that I have gone hunting by myself and seen some pretty amazing animals and/or areas but trying to put those experiences into words so that someone else can understand what you've seen is extremely hard to do effectively. Another plus that comes with hunting around friends and family is simply the joy of humor! Last year I briefly went out hunting with my brother and dad while we showed a friend how we hunted together as a family. That friend filmed our hunt and put us on a video he called Elk Tour along with 3 other groups of hunters. What I enjoyed the most about watching the video after it was finished was that no matter what group of hunters you were watching, you heard just as many laughs (if not more) than you heard elk bugling! Everyone's humor is not the same which important to remember while you're hunting and having a good time. It is important that you not get caught up in trying to be someone you're not. When you are being yourself and having a good time, naturally those around you will also enjoy the hunt. As I mentioned earlier, there are times that I hunt alone and I enjoy those hunts as well. There is nothing against hunting by yourself nor is it any less of an adventure/experience. These are my three top reasons of why I look forward to hunting season so much. If you have any other reasons please share them in a comment below! As with all posts on Idaho Pursuit, the following is my honest opinion. I am simply writing to share my experiences and my posts are my own words and thoughts. My posts are not meant to offend or insult any person of any nature nor are my posts designed to make any formal statement of any kind. If there is anything on my blog you dislike or disagree with you are free to express your opinion by emailing me at kjones2626@gmail.com.